«My favourite cinema is the one that I remember when watching my first movies as a child – Simone Suko says. 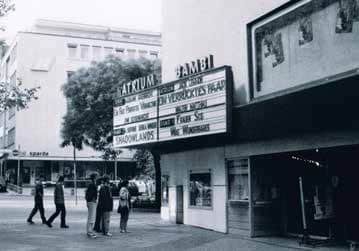 – My parents took me with them to Stuttgart, to the Atrium Cinema, near the Koenig Street precinct. The first time I’d been there without them, that became my own ‘Independence Day’, so to speak». Holli Dempsey: "I love going to the cinema. But it's too expensive"
The Atrium, which opened in 1952, was the cinema where noted director, Roland Emmerich, held many of his premieres, like Moon 44, and others in the 1980s and early ’90s, as well as many of the longer-running roadshows, including Doctor Zhivago. Being only a small girl at the time, I didn’t have the chance to attend them. However, enjoying and remembering a film doesn’t just depend upon the film itself. I mean that watching a film in a cinema is a completely different experience to watching it on TV. Even to this day, I can still remember the colours on the walls. The seats, also the smell of the Atrium. In the ’70s, it was twinned and further screens were added. Paul Roberts: "All my favourite cinemas were local"
The Atrium closed in early 1996. So the movie première of Independence Day, released in the September, had had to be staged elsewhere. In its place, today, sits an office building. I hope the people now working there will at least be aware of the heritage of their workplace. Well-known for her appearances in many film and TV roles – among them: Galileo: Alfred Hitchcock, Love Diary, K11 and Herzflimmern – as well as in several commercials for Siemens and BMW, Munich-based Simone Suko works both as a movie and stage actress. Alvin Frank: "My life and my family are dedicated to the Theatre Company"